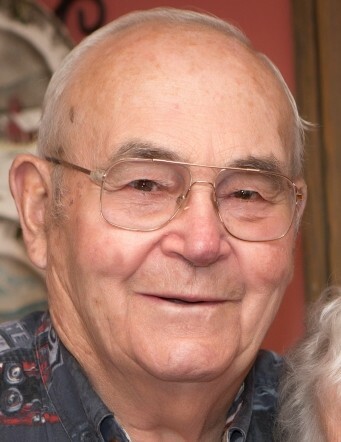 Robert J. Shawback, 87, of rural Tonica died unexpectedly August 19, 2018 in University of Iowa Hospital in Iowa City, IA. Funeral services will be 11:00 AM Saturday at Central Church of Christ in Streator with Pastors John Puckett and Tom Hughes officiating. Burial will follow in Fairview Cemetery in Tonica with full military honors conducted by the Streator American Legion #217 and Streator VFW #1492. Visitation will be Friday from 6-8:00 PM in the Hurst Funeral Home in Tonica. Additional visitation will be in the church on Saturday from 10:00 AM until time of services. Mr. Shawback was born in La Salle on April 5, 1931 to Joseph and Mildred (Klehm) Shawback. He married Cora Wright on February 6, 1951. Mr. Shawback served with the US Navy from 1951-1955 and as a reservist from 1955-1959. After his service in the Navy, he worked as a farmer which was his greatest joy, aside from his grandchildren and great grandchildren which he adored. He was also loved dearly by his nieces and nephews. Mr. Shawback enjoyed boating, fishing, and camping in his RV. Winters were spent in Harlingen, TX. He also liked playing board games and cards. Mr. Shawback was a member of his church for 67 years where he also served as deacon and elder. For 54 years, he was a member of the Lostant American Legion. Mr. Shawback is survived by his wife Cora of Tonica; three daughters Sally (John) Puckett of Paris, IL, Beth (Mike) Runge of Elsberry, MO, and Peggy (Tom) Hughes of Cortland, IL; twelve grandchildren; fifteen great grandchildren; nieces; and nephews. He was preceded in death by his sister Bernice Gage. In lieu of flowers, memorials may be directed to Pinehaven Christian Children’s Ranch at 200 Pinehaven Lane South, St. Ignatius, Montana 59865.